If you came here from,Paulien's blog then you are on the right track. If not, go back to Swirlydoos' blog and start from there. We have some amazing projects for you to see today !! Make sure to leave a comment on all of the blogs for a chance to win!!! Make sure you have LIKED & FOLLOWED Swirlydoos on Facebook!!! We are offering up an Authentique Prize Pack to give away today. The party continues over at Irene's Blog Have fun! Thanks for hopping with Swirlydoos this month! Classique Elegant is the best paper line EVER!!!! Thank you for sponsoring the prize for Swirlydoos blog hop. Your papers are all beautiful. I am so glad you are hopping with Swirlydoos. I love you paper!!!!! 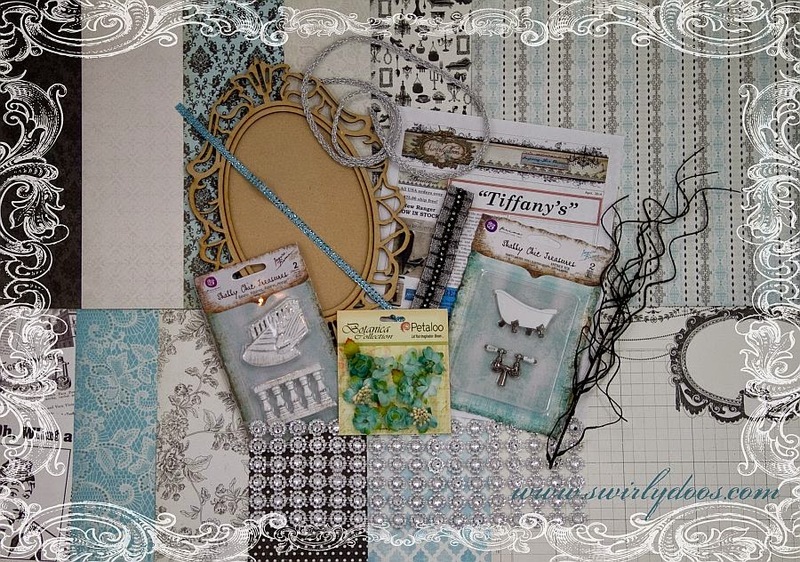 I'm a newbie to scrapbooking and to Swirlydoos blog hop and the first paper i noticed was the Classique Elegant. Totally love it and it matches perfectly with my nieces wedding colors. I'll be making some wonderful gifts using April's kit. Yea me! The Classique collection is just divine! Thanks for joining our hop!Your papers are a joy to work with-such great weight and designs! The papers in the kit are so soft and pretty. Love the greys. thanks for having the hop. Thank you so much for hopping along with us and offering that awesome prize! Thanks so much for participating in the Swirlydoos blog hop this month! Your line of papers that are in the kit this month are gorgeous! I love working with Authentique papers! Love all about the kit, great colors!!!! Thank you for hopping with us. Papers are gorgeous! Thanks for contributing to the Swirlydoos hop today. The Authentique Paper Line is my very favorite papers! Your Elegant collection is just that, total elegance! Thanks for being part of our blog hop! Thank you for contributing to Swirlydoos BH. Your new paper line Elegant is beautiful!! Gorgeous paper line, thanks for hoping. What a beautiful bunch of papers in this kit! Thank you and thank you for providing a prize for the hop too! Thanks for participating. These papers are gorgeous. Thank you for sponsoring one of the prizes. These papers are absolutely gorgeous. Authentique papers are my favorite in the whole wide world. They make creating so easy! Thank you for participating in the blog hop. Thanks for sponsoring our fun blog hop! I love your products!! You have some beautiful papers! Not only the patterns but the quality of the paper itself I often find is superior to most! Love it! Loving the beauty of the papers! Fantastic colors, fits my style, love it! I see a lot of pretty teal in this kit and I am crazy in love with that color now. This si a very beautiful and definitely elegant collection. And there is a lot of inspiration on the hop showcasing the products in some beautiful art. Fabulous kit..thank you for participating in the hop! The DT really did your papers justice! Love the paper in this collection. I need another stripe in there. I always love Authentic papers. These are on my list to get for sure now. The Swirlydoos Design Team has done a fantastic job with the kit. I love all your papers! Thanks for participating in the blog hop! So far this hop has been fabulous. I love both companies, so this is a great pleasure! I am loving the hop!!!!!! Thank you so much for being one of the Swirly Hop sponsors!!!! I cannot possibly tell you how much I'm loving the gorgeous papers that came in this month's kit: so elegant and inspiring!!!! I love the Swirlydoos kits! and the chance to win wonderful prizes too. Thanks for being in on it. Thanks for introducing me to this hop. I really like the projects I've seen so far! Awesome,thanks for the fun hop!